Make Gift Giving Hassle-Free with GC Regalo! Two of the most prominent qualities of a Filipino is its being hospitable and its being observant with whatever occasion it may be. That is probable the reason why, minutesary, housary, daysary, weeksary, and monthsary are invented. There comes fiestas, birthdays, Christmas, anniversaries, reunions, and a lot more. According to studies, Filipinos are also known to celebrate Christmas the longest, from the very first day of September to First week of January. And with Christmas comes different activities, as they say, to commemorate love and peace through gift-giving as portrayed by the wise men giving gifts when Jesus was born. Christmas season is also a time when parties don’t stop and most of these parties include exchanging of gifts. What I am really looking forward to this season are the gifts (and you might not want to be adult) and of course, what challenges me most is choosing gifts. I often spend more time roaming around the department store and find nothing that would best fit the person I want to give gifts. One time, I have bought a dress to my goddaughter and to my disappointment she can’t use it yet until maybe three years later. It is not just a disappointment for me but for my goddaughter as well. Who might want to receive a gift that you can’t use? So, it came into my mind the possible ways of giving a gift that will not be put into a waste. If you give cash, it might be spent to useless as well. That is when I discovered using Gift Certificates or GC. These Gift Certificates are good as cash expect for the fact that it can only be used on specific merchants. There are many merchants who are offering and accepting GCs for the goods and services they are offering. There are GCs for spas, restaurants, malls, movies, barbershop, and even in amusement parks. Gift certificates are either in amount or per item. There are GCs that can only be used for a certain item or you can use it just like money. However, GCs are usually for one-time use only and you cannot get your change if ever the item you bought is lesser than the amount of the GC you have. What makes a Hassle-Free Gift Giving? No need to spend more time in a department store what to buy. You will give your recipient to choose what they want. It doesn’t go out of style. Freedom to buy what fits you. No disappointments, just pure excitement. Sodexo premium pass, gift check and gift certificates can be used in over 9,000 merchants nationwide. You can check the merchant partners where you can use your Sodexo premium pass. This premium pass can be used as Employee Incentives and Rewards to let your employees feel that you value them and they deserve a reward. 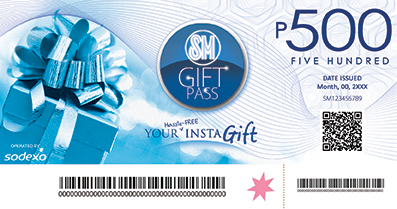 SM Gift pass can be used in all SM Malls nationwide and can be used in almost all items exclusively distributed by SM. This can be given ideally to everyone especially those shopaholic and everyone who feels that SM got everything for them. 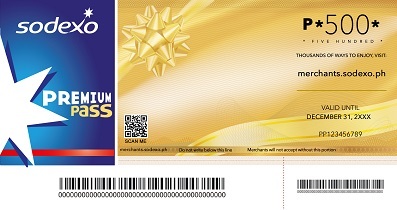 GC Regalo is the front-liner in distributing Gift Certificates in the Philippines. GC Regalo is owned by SM Company, the country’s number 1 mall and Sodexo the leading provider of gift certificates in the Philippines which is a French multinational company present in 80 countries.They are also offering an online shopping facility so can send your gift certificates to anyone around the country. They are also giving P100 discount when you subscribe to their newsletter (nothing to lose, you will get everything exclusive from them) plus they also offer free shipping if you order at least P2000 worth of Gift Certificates. Give Gifts with GC Regalo!